We have become used to the idea of the group discounting service provided by BoilerJuice, which hunts for the lowest prices by aggregating consumer requests. Now, you can choose when you need your oil delivered. 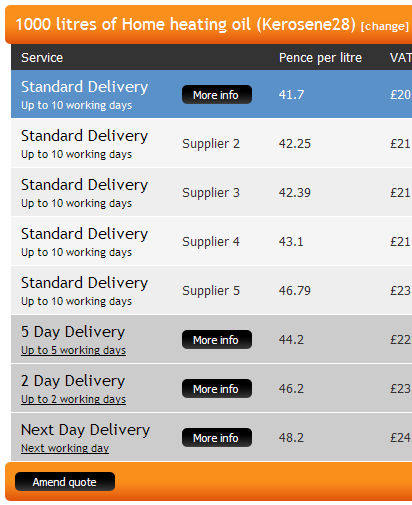 The typical lead time is ten days, but BoilerJuice will now give quotes for much quicker deliveries. This is now the standard price-comparison service they offer; there don't appear to be any supplier price comparisons. By the way, you might want to try an independent BoilerJuice-style service: The Heating Oil Club. It gave a worse quote for me, but is definitely one to try as it gives an instant figure.